Mommy This &That: OB news and Whoa Doggy! OB news and Whoa Doggy! So today was my monthly OB visit and we came to several conclusions...first, in two weeks we will know if the little person in my belly is a girl or a boy. And secondly...they decided it was a good time to change my due date. I've had 3 ultrasounds since finding out I was preggers and each time baby measured big than they initially estimated me. We discussed this today at the appointment after the midwife (same one from last time that I absolutely LOVE) felt for my uterus and commented how it was sitting a bit higher than expected for being only 18 weeks and 3 days. So Hubby and I told her about the measurements at each u/s we had in the past and she promised to look into this and get back to us. And she did...she said after reviewing my ultrasounds and the measurements and comparing that to my the placement of my uterus, my new due date is going to be 2-12-2009. But the kicker is that I could actually also have the date of 2-7-2009. So what does this all mean? For me anyway? It means that the third semester will be sooner than I thought! And that I should feel baby any day now!! That I can not wait for...it will truly thrill me. Baby was moving around like crazy today and his/her heartbeat was fast and strong. I don't think I could ever tire of hearing that heartbeat so strong. I love your belly. Really, REALLY treasure every moment. I can't wait to hear if it will be pink or blue for you! Oh my gosh I love the pics! 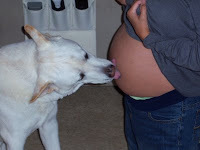 Oh my gosh, the dog licking your belly, that is so cute! I know how you feel about changing due dates. It gets frustrating at the end if one passes without anything happening. Take heart, the baby does come out eventually :) Hopefully you won't be late at all! Can't wait to hear the gender...if you're planning on divulging! 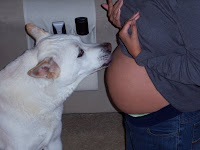 I love your belly pics, so cute! Finding out the gender is so exciting, I hope you tell us when you get the news! So is your preganancy ticker over there ---> updated with the new due date? LOL LOL LOL Those pictures are GREAT!!!!!!! That picture of the pooch smooching your belly is precious!